Although small, don’t underestimate what Fowey has to offer, with numerous interesting shops and galleries to browse that line the narrow road winding it’s way through the town. 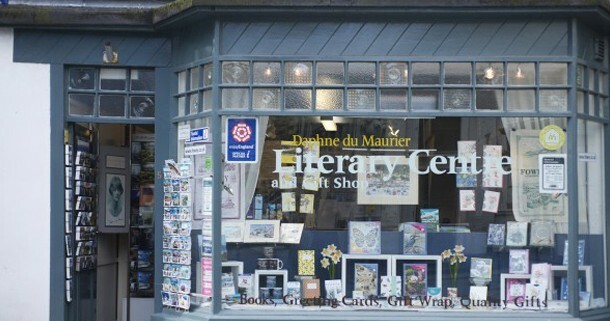 Start from one end and make your way to the other, being sure to stop by The Literary Centre and Gift Shop to learn all about the life of Daphne Du Maurier, the renowned author and playwright that lived in Fowey and received much of her literary inspiration from the surrounding area. The Daphne du Maurier Literary Museum and gift shop. Image courtesy of Holly Gear, Barefoot Media. Experience the marine life found around the Cornish coast without getting wet at Fowey’s Aquarium, where only native and local species inhabit the tanks, which includes conger eels, lobsters, and various other sea creatures. The charm of the aquarium is exaggerated by the fact that the tanks naturally receive fresh sea water, which is pumped in daily at high tide, and brings with it various creatures such as sea-squirts, sponges and tube worms that arrive as plankton in the water then grow on in the aquarium. 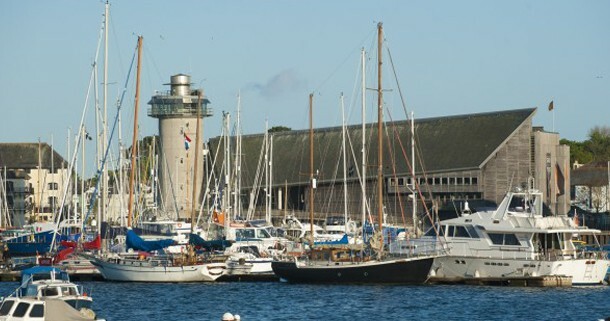 (Situated on the town quay, the aquarium is well within walking distance from The Old Quay House). Discover everything maritime, from the art of navigation to meteorology and weather systems at the Maritime Museum in Falmouth, exploring our unique maritime heritage that can be discovered over the museum’s three floors, each focusing on different aspects of industry, work and communications. With interactive and story-telling displays, a regularly changing exhibition space and a regatta of ships and boats of all sizes across the ceiling, including Olympic gold medalist Ben Ainslie’s Rita. (Falmouth is an hour’s drive from Fowey, and well worth having a wander around if the weather permits). Falmouth’s Maritime Museum. Photo courtesy of Adam Gibbard and Visit Cornwall. Relax and completely unwind at Carlyon Bay Hotel’s spa, where you can choose from over 40 relaxing treatments, lounge next to the warm indoor pool while looking out to sea, or let all your worries melt away in the jacuzzi, sauna and steam room. You can also enjoy the heated outdoor pool whatever the weather, and for visitors wanting a little more activity in their holiday, the spa also offers extensive fitness suite facilities. (The spa is only a 15 minute drive from Fowey, and regularly has deals on treatments which are worth checking before you visit). 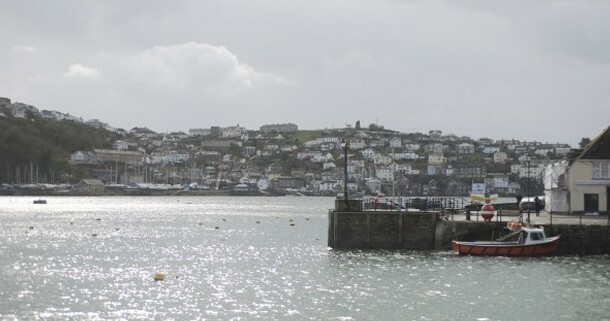 Explore Fowey’s surrounding area whilst remaining in the comfort of your car and soak up the sights from there, with plenty to be seen on the Cornish coastal roads. Drive in a southerly direction along the coastal road towards the picture-postcard fishing village of Mevagissey and the Roseland, or north towards Lansallos and Polperro. Take a picnic, or grab a bite to eat at the plentiful cafés and restaurants along the way. With acres of both productive gardens and pleasure grounds, you will not regret discovering The Lost Gardens of Heligan. The shop and multiple cafés throughout the gardens are great for picking up souvenirs or something to eat, and the towering bamboo and canopies of exotic plants provide shelter from the rain if the weather’s not on your side. Wrap up in waterproofs and walk the whole loop, which is a highly rewarding experience, with emus, sea views and the longest Burmese Rope Bridge in Britain, for visitors with a toleration for heights! 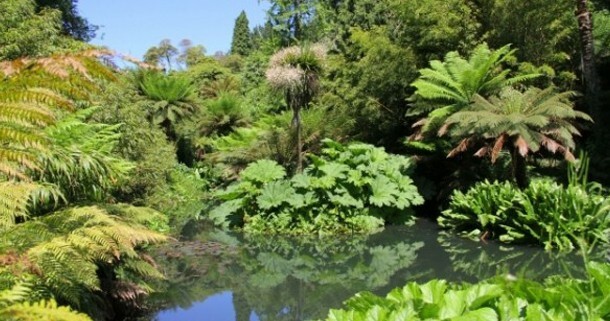 (Heligan is only a 30 minute drive from Fowey, with some great views along the way). The jungle trail in The Lost Gardens of Heligan provide a natural shelter from the rain. Photo courtesy of The Lost Gardens of Heligan and Visit Cornwall. The Eden Project emerged from a china clay quarry, and now hosts miles of trails to explore, both inside and out, the ultimate escape from the wet weather. Transport yourself to the warmth of the tropics by spending your day following the paths within Eden’s biomes, where exotic trees and tropical plants thrive in the rainforest-like conditions. Make sure you leave enough time for some lunch or a tea and cake break though, the Eden Kitchen is not to be missed! (The Eden Project is only a 15 minute drive from Fowey, with plenty of parking and park and ride facilities too). For the typical escape from the rain, check what’s showing and book tickets for nearby White River Cinema in St Austell, or Newquay Lighthouse Cinema in Newquay. For theatre productions, Hall For Cornwall in Truro (about 45 minutes drive) is the place to see some fantastic plays, opera and performances, including the most acclaimed new play of the decade, The Father, and Banff Mountain Film Festival. Unfortunately the Tate St Ives is closed until March 2017 for major construction work, but the Barbara Hepworth Museum contains the largest group of Hepworth’s works, permanently on display at Trewyn Studio and garden museum where she lived and worked. Experience the former home of the world-renowned artist and the studio in which she created her beautiful sculptures, which you can get up close and personal to in the garden if the weather isn’t too bad. Whilst in this region of Cornwall, another great destination for exhibitions and installations is Newlyn Art Gallery, with some really interesting collections making their way onto the walls of its spaces in Penzance. (A little bit of a drive, The Barbara Hepworth Museum is an hour and a quarter’s drive from Fowey, but why not make a day of it and explore the surrounding area, with the beautiful Sennen Cove only another 30 minutes down the road). 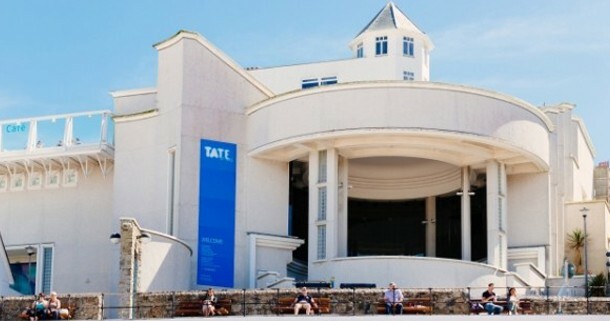 The Tate St Ives. Image courtesy of Ian Kingsnorth and Visit Cornwall. Visit the numerous National Trust sites around Cornwall, including Lanhydrock’s late Victorian country house and extensive gardens. Founded in 1895, The National Trust is a charity that relies on membership fees, donations and legacies that they use to help conserve historic buildings, wildlife, the nation’s heritage, and numerous other valuable efforts. (It is just a 20 minute drive to National Trust’s Lanhydrock from Fowey).